The Majlis Khuddamul Ahmadiyya The Gambia (MKATG) has successfully concluded its 30th Annual National Convention at Nasir Ahmadiyya Senior Secondary School in Basse, Upper River Region. The event held from Friday 27th to Sunday 29th December 2013 was meant to train its members on true Islamic values; to induce in them the love for the best of mankind, Sayyedna Muhammad Mustapha (SAW) and to inculcate in them the spirit of love and service to their country. Addressing the closing session of the event, Mr. Baba F Trawally, Amir of the Ahmadiyya Muslim Jama’at The Gambia stressed the need for good moral practice among the youth, especially in this age. “For one to succeed in his strive for moral and spiritual training, he has to hold fast to the Unity of Allah Almighty as the number one principle. Allah the Almighty says that in order to succeed in training, Allah the Almighty must be continuously praised, remembered and His Holiness extolled. He warns that we must not be like those who forgot Him and He consequently made them forget themselves. Istighfar (seeking effacement for our weaknesses and shortcomings) is another important branch of training because it is Allah Almighty alone who can efface our weaknesses and make us highly moral and spiritual beings. Success in this regard is impossible without Istighfar. The Promised Messiah and Imam Mahdi (as) said that he who does not do istighfar is not better than the worms of the earth because he will not succeed in his endeavours. “The believer is indeed very fortunate to have the best guidance in the form of the Holy Qur’an, the Sunnah, the institution of Salat, fasting, etc. We must follow these teachings to the best of our abilities. Love the Holy Qur’an with all your hearts, recite it thoughtfully and act on it teachings to the fullest. The Sunnah of the Holy Prophet Muhammad Mustafa (saw) should illuminate your countenances because he has said that in the time of disorder and misguidance among the Ummah, all shall be hell-bound except those whose distinctive feature is the Sunnah. Let the delight of your eyes lie in Salat because it is the light to salvation and the key to Heaven. It purifies the heart and eliminates all moral and spiritual impurities. 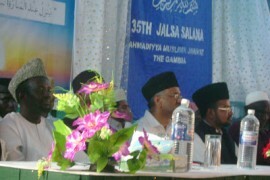 Earlier in his opening address, Mr Tahir Ahmad Touray, Sadr (President) Majlis Khuddamul Ahmadiyya The Gambia said that Mjlis Khuddamul Ahmadiyya, the youth association of the Ahmadiyya Muslim Jama’at, was formed on 4th February 1938 by Hadrat Mirza Bashiruddeen Mahmood Ahmad, the second Successor to the Promised Messiah and Imam Mahdi (as). “The contemporary world is crying for peace because destruction is looming from every horizon. These dangers are due to greed and double standards in personal dealings and dealings among different peoples. These qualities are born of heedlessness to righteousness, the teachings of the Holy Qur’an and the Sunnah of the Holy Prophet Muhammad Mustafa (saw). All actions must be based on true and sincere intentions. Allah Almighty says that it is the building built on His fear is worthy of His acceptance. “As Ahmadi youth, our morals should be beyond blemish. Our love for our country should be exemplary. That is the commitment we have just made in the pledge we made at the beginning of the convention. This commitment can never be a reality if we are not immersed in the light of righteousness, humility and sincerity. That also is inextricably linked to the sincere belief in the Unity of Allah Almighty. Speaking at the opening session, the Regional President of Ahmadiyya Muslim Jama’at in Upper River Region, Bro. Musa Sanneh welcome the participants to the region. He advised all the participants to spend the three days of the convention on the remembrance of Allah so as to develop morally and spiritually. He further noted that Muslim youth should try to obey and practise all the 700 commandments of Allah contained in the Holy Quran. In his speech on the topic: “Moral and Spiritual Reformation”, Ust. Ebrima Bah, Area Missionary of the Ahmadiyya Muslim Jama’at Central River Region said that God the Almighty has admonished mankind not to follow the footsteps of Satan. Ust. Bah went on to say that youth play a very important role in the society and therefore, it is important that they protected themselves from evil. “The best way to protect yourself from evil is through prayers as advised by Holy Prophet Muhammad Mustapha (saw). So prayer is one of those things that can help you from moral decline. Holy Prophet (saw) is reported to have said that this world is a paradise for disbelievers and hell for a believer, but hereafter, the believers would enjoy paradise and disbelievers would face hell”. 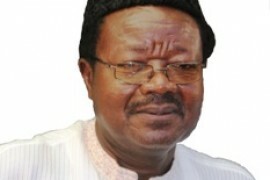 He also enjoined the youth to become spiritual and righteous so that they can play their role in national development. Mr. Momodou Camara of the Regional Education Directorate at Region six, an invited guest expressed gratitude for what he described as warm welcome accorded to him. He hailed the efforts of the Ahmadiyya Muslim Jama’at and said that the convention is a great way of improving the morality of today’s youth. He further noted that this programme will enable us to better position ourselves in worshipping Allah. He also advised the participants to pray for those countries that are in trouble worldwide that Allah enables them to hold such events so that they also get the benefits. 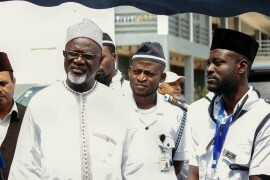 Another guest Mr. Samba Bah also thanked the Ahmadiyya Muslim Jama’at for helping in improving the moral status of the youth by hosting such programmes. He also noted with satisfaction the work of the Ahmadiyya Muslmi Jama’at in spreading the true message of Islam far and wide. Speaking on the topic: “The Importance of Khilafat in the Contemporary World” Ust. Dawda SK Cham argued that the institution of Khilafat is more than a necessity for the contemporary world as it is the only heavenly institution left, to successfully gather the Islamic faith under one solid and united family. “Khilafat is the only institution to whose rope we all must hold very tight to save the world from all the awful menaces, and attain the victory of Islam”. Mr Nurudeen Mbye spoke on the topic: “Duties and Responsibilities of the Youth”. As part the convention activities about fifty (50) cyclists rode on bicycles from different parts of the country to converge in Basse for the sole purpose of serving humanity in order to earn the love and pleasure of Allah Almighty. Similarly, the event was punctuated with academic and sports competitions between and among regions countrywide.